Sony's S Series Walkman guns for Apple's iPod nano | What Hi-Fi? 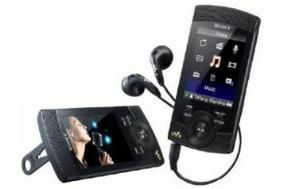 The S540 is billed as the first ever Walkman multimedia player with built-in stereo speakers: 'Don't keep your tunes to yourself. Share them in rich, stereo sound', Sony instructs worryingly. A 2.4in LCD screen is your portal to video and music playback, plus there's an FM tuner with a recording facility, too. The claimed battery life of up around 42 hours sounds impressive, though it's dependent on the file size, volume and settings as always. Using the bundled Content Transfer Software, Sony also reckons you'll be able to use iTunes 8.1 for transferring tunes should you so desire. You can also download BBC iPlayer shows from your PC and transfer them straight to the S Series Walkman. The Sony NWZ-S544 8GB model and the NWZ-S545 16GB model are both available now.